Making Artificial Vision Look More Natural « Adafruit Industries – Makers, hackers, artists, designers and engineers! Current technology does not have enough specificity or precision to reproduce natural vision, he said. Although much of visual processing occurs within the brain, some processing is accomplished by retinal ganglion cells. There are 1 to 1.5 million retinal ganglion cells inside the retina, in at least 20 varieties. Natural vision -including the ability to see details in shape, color, depth and motion — requires activating the right cells at the right time. The new study shows that patterned electrical stimulation can do just that in isolated retinal tissue. The lead author was Lauren Jepson, Ph.D., who was a postdoctoral fellow in Dr. Chichilnisky’s former lab at the Salk Institute in La Jolla, California. The pair collaborated with researchers at the University of California, San Diego, the Santa Cruz Institute for Particle Physics, and the AGH University of Science and Technology in Krakow, Poland. They focused their efforts on a type of retinal ganglion cell called parasol cells. These cells are known to be important for detecting movement, and its direction and speed, within a visual scene. When a moving object passes through visual space, the cells are activated in waves across the retina. 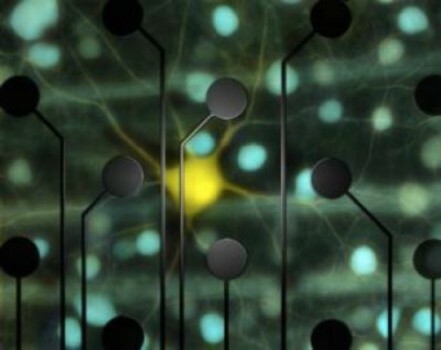 The researchers placed patches of retina on a 61-electrode grid. Then they sent out pulses at each of the electrodes and listened for cells to respond, almost like sonar. This enabled them to identify parasol cells, which have distinct responses from other retinal ganglion cells. It also established the amount of stimulation required to activate each of the cells. Next, the researchers recorded the cells’ responses to a simple moving image — a white bar passing over a gray background. Finally, they electrically stimulated the cells in this same pattern, at the required strengths. They were able to reproduce the same waves of parasol cell activity that they observed with the moving image.